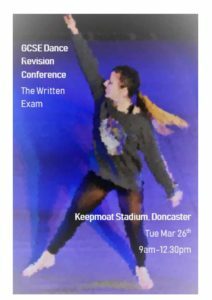 ICA-Perform, the Performing Arts Department at Hall Cross Academy are organising a Student Revision Conference at Keepmoat Stadium, Doncaster on Tuesday March 26th 2019. The conference aims to give students and teachers an understanding of the expectations of the GCSE Dance written paper. There will be group tasks, discussion and some interactive activities to support students in their preparation for the exam. Understanding command words and their relationship to mark values. Time guidance for each section. Unpicking the questions – What is the question asking for? Understanding how marks are awarded by examiners. Understanding the difference between contributory statements and evaluative statements. Approaches for answering the extended writing questions; 6 marks and 12 marks. Other schools interested in attending should email rsm@hallcrossacademy.co.uk for details.